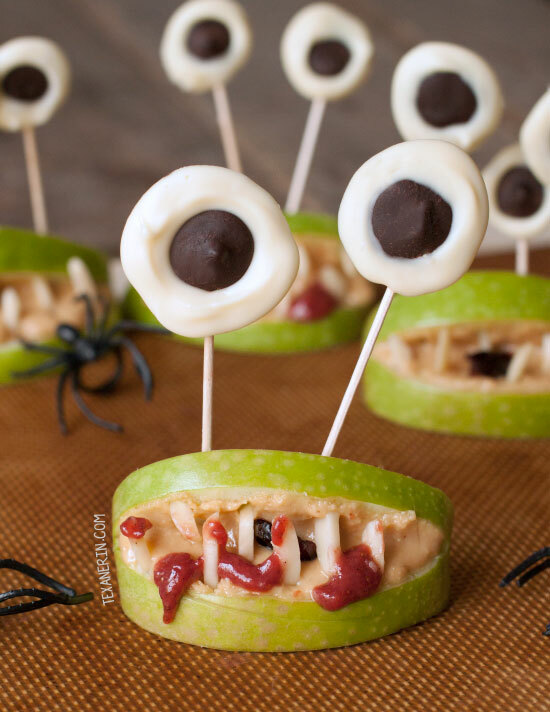 These monster mouths are perfect healthy Halloween treats and just use apples, strawberry jam, nut butter, and almonds / sunflower seeds. 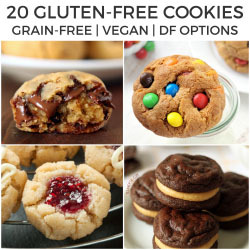 Naturally paleo, vegan, nut-free, grain-free, gluten-free and dairy-free. I’ve been trying to come up with healthy Halloween treats free of processed junk and it’s pretty difficult. It seems like all the cute stuff is full of candy or food coloring. Then I got the idea for these! I’d seen these kind of Halloween monster mouths before but they contain candy, usually marshmallows, and sometimes red food coloring. And none of them had cool eyes! Or bloody mouths. Or were munching away on flies (dried cranberries). Blackberries – Too expensive unless they’re on sale. Romanesco broccoli – Looks really neat but I’ve only seen this a few times in my life (not that I ever actively look for it). Blueberries or raspberries – I’m guessing the blueberries would be too small and raspberries are again too expensive. Olives – Nope. Not going to happen. These are for kids! Maybe that’d turn them off? Or maybe that’s just me. Physalis – I don’t even know if these are common in the US, where most of you live, so… no. 10/14/14 update: I just saw this idea on Pineapple & Coconut for lychees and blueberries. Check out Shanna’s creepy eyeball martini to see how she did it. This is, by far, the best creepy eye idea! 10/30/15 update: One reader, Cymbre, used purple carrots for the eyes. They look great! All I came up with was chocolate eyeballs! I didn’t want to use those hard sugar candy things because they’re probably pure sugar or sugar mixed with weird stuff. I’m cool with chocolate, though. Then I piped one glob of white chocolate onto the center of a black glob of chocolate and realized… whoops. But it turns out that piping the semi-sweet chocolate first worked and though I haven’t tried it the other way, I think it works even better than piping the white part first. So while I was piping away, Mr. T went grocery shopping to look for other cool things for the eyeballs and found some grapes. I’m sure any kind of grape would work but he found these really large pinkish orangish ones. To get the chocolate chip in the middle to stick, he cut a little X into the non-pointy tip of the grape, peeled back a little bit of the skin, and just stuck a chocolate chip there. They stayed firmly in place for many hours but I just have a feeling they’re going to fall off eventually. If you try this, know that it might fail. But the grapes alone were neat enough! And you know what would have been so much more disgusting? To peel the grapes. I doubt the chocolate chip trick would work then, though. Figuring out the blood was easy. Homemade strawberry jam sweetened with just honey. I used strawberry jam for blood in these witch finger cookies and it looks and tastes great. See that second picture? Mr. Texanerin complained that this one wasn’t “realistic at all” (like the others are?!) because there should be blood on the teeth. How can it eat a fly and have blood in its mouth but not have bloody teeth?! So I added more blood. And I like how it looks. I used slivered almonds for the teeth in these monster mouths and they were perfect. Just make sure to poke a hole with a sharp paring knife where you want to place the teeth to make it easier to stick the almonds in. And when inserting the upper teeth, flip the apple wedge upside down to make it easier. And because these are just fruit, nut butter and chocolate, if you choose, these monster mouths are super allergy-friendly. They’re naturally paleo, grain-free, gluten-free, dairy-free + vegan (be careful of the jam and chocolate you use) and can be nut-free if you use Sun Butter and sunflower seeds for the teeth. For something less healthy, try my spider cupcakes, which also have grain-free, gluten-free and whole wheat options! For another whole wheat option, these healthier Halloween sugar cookies are awesome! Pictures updated in August 2018! Here’s an old one for reference. Place the toothpicks evenly on a Silpat, piece of parchment paper or wax paper. Using a Wilton Tip 12 (or whatever tip you want to use) pipe a 1/2" - 3/4" circle of semi-sweet chocolate around the 1/4" - 1/2" top of the toothpick. Make sure that the chocolate is also going under the toothpick. I made sure of that by ever slightly pushing down the other end of the toothpick so that the top part of the toothpick, which you're piping onto and around, elevates just a little. Let the circles cool and firm up completely, about 1 hour. If you're in a hurry, place them in the refrigerator for about 20 minutes. Use Tip 10 (or whatever tip you like) to pipe a circle of white chocolate around the semi-sweet chocolate circles, making sure that the two types of chocolate overlap by at least 1/4". This makes the eyeballs easy to remove from the Silpat and much sturdier than if you just pipe the white chocolate next to the the semi-sweet chocolate. Let the circles cool and firm up completely, about 1 hour or place them in the refrigerator for about 20 minutes. Core the apples and cut into 4-5 pieces (it'll depend on the size of your apples). Try to cut them at such an angle that they stand easily on their own. Cut out a wedge for the mouth. Try not to have the bottom half of the wedge be at a downward angle so that the peanut butter doesn't seep out. Also try to make the wedge large enough so that you can easily add the teeth. Use a pastry brush or dip the backs and bottoms of the apples in the lemon juice. This is to prevent the apples from browning. There's no need to use lemon juice on the inside mouth part since that'll be covered up with peanut butter. Spread on a little bit of peanut butter. If you want to add strawberry jam do that now. You can also do it after adding the teeth but it's a little more difficult then. Toss in a dried cranberry. Use a sharp knife to stab the parts where you want to add the teeth. There's no need to dig a hole. This will be inserting the teeth easier. Insert the teeth on the bottom. Flip the mouth over, stab the parts where you want to add the teeth, and insert the teeth. Turn back over. Place the mouths on the serving plate. Gently remove the eyeballs from the Silpat. Insert them straight down into the mouths or in a way that supports the mouths and doesn't make them fall over. Serve! If using lemon juice, these stay at room temperature for at least 8 hours without browning. 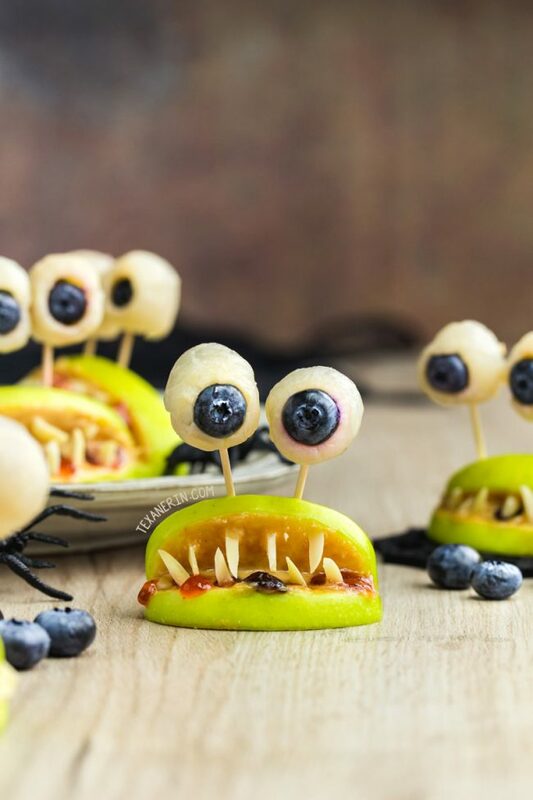 See the beginning of the post for fruit alternatives to the chocolate eyeballs. Please see the last paragraph of the post for allergy-friendly notes! I did a backwards date search to try to find who came up with the original apple mouth idea. It appears to be from Family Fun magazine in 2008 but I can't find anything on their website to link to. 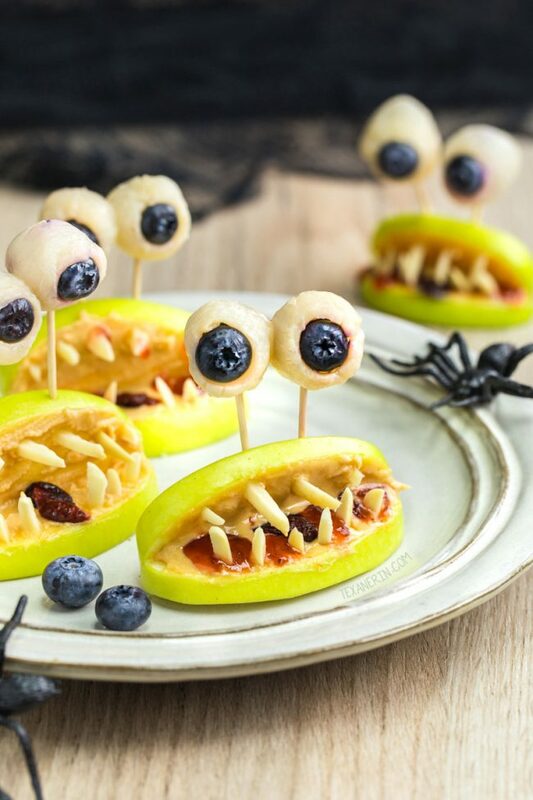 46 comments on “Healthy Halloween Treats – Monster Mouths (paleo, vegan)” — Add one! The candy googly eyes are made of Royal Icing which consists of powdered sugar, water, flavorings like vanilla and almond extract, and egg whites. If you are striving for a vegan diet, these are probably not for you. If a treat that consists mostly of egg whites doesn’t sound bad to you, there are many recipes for Royal Icing and tutorials for making these eyes, but at the cost of a couple bucks, I’d get the store-bought eyes or if my budget were really tight, i’d just use Necco Wafers or smarties and a food-safe marker to make eyes. With Necco Wafers, which are bigger and a red and black marker you could draw all kinds of expressive eyes: winking eyes, blood-shot eyes, kind eyes, etc. The amount of red dye you would get from a marker is minimal, so I wouldn’t sweat it. Thanks for the tip! I sometimes use the store-bought kind and then just recommend people remove them. ;) The ones I have access to where I live contain a whole lot of nasty stuff in addition to the not-so-bad-sounding ingredients you listed. I’d never heard of Necco wafers before! What a fun idea. Thanks for your comment! So stinkin’ cute!! I LOVE it!! These are so cute. I mean scary. I mean cute. Okay, scary and cute. These are brilliant Erin! I swear – the creativity is amazing and I love that they are not full of processed stuff. Fabulous job! AHHH! I just love these! I love them because they are so adorable!! Also, because they are healthy! I don’t know about anyone else but I hate feeding my kids junk. My husband basically bribes them with marshmallows all day long …. ugh. It would be wonderful if I could make these and they loved them just as much as I do! Great Job!! So adorable! My daughter is only 2 and I’ve been holding off on introducing her to candy for as long as possible. These are a perfect alternative! How cute are these?!? I always dreaded Halloween when my daughter was little because it was a non-stop sugar fest for days afterward. Something really cute like this would have been so, so much better. My kids would love these. I will just sub sunbutter instead of peanutbutter because of an allergy! These are so much fun! I was totally going to suggest grapes before you mentioned them, too…they’re so creepy as eyeballs when you peel them. My kids will get a kick out of making these this month! I love everything about these, but the blood is freaking me out a little bit. Loving the oogly googley eyes though! This is so stinkin adorable. My kids would love to make these. This is the first healthier “scary” Halloween treat I’ve seen this year! I love this idea. Too cute! FINALLY! A super creepy awesome halloween treat that isn’t pure junk! Love these, Erin! This is such a cute idea! 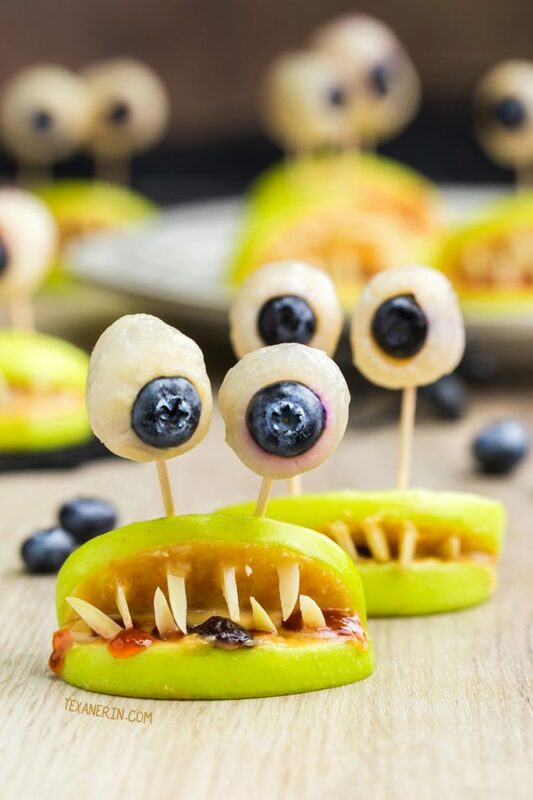 This would actually be the perfect thing to make at a Halloween party, with the kids jumping in to make their own monsters. Ooh, that’s a great idea! I guess as long as someone prepares the actual apple part beforehand, it’d work out really well! The lemon juice kept the mouths from browning for as long as I kept them out (8 hours). 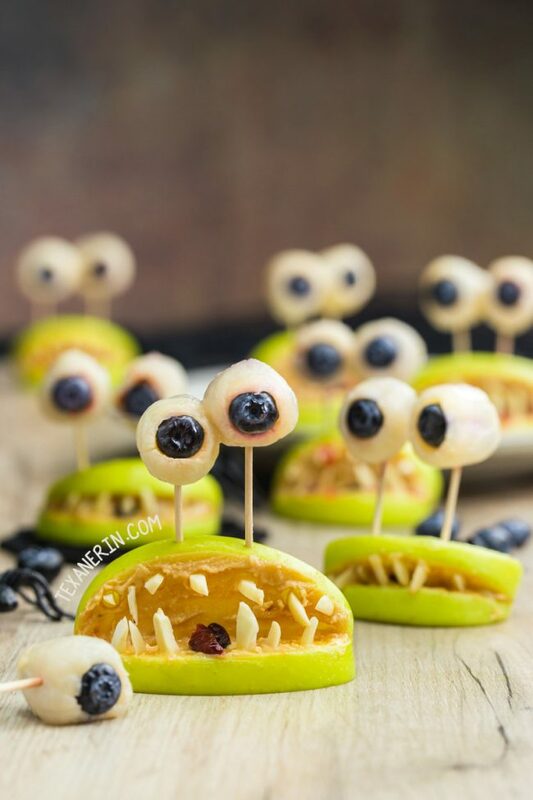 My kids LOVE olives but I wasn’t sure on how to totally make them look like eyeballs since they like the black ones and not the green and the green make better eyeballs. Plus for my drinks I needed a sweet food for eyeballs not savory, and thanks for sharing my drinks!! I can’t WAIT to make these for my kids for after school snack this week. They are going to be so surprised! I love these!!! When trick or treaters come to my house (which is rare here in Australia) I only ever have fruit to offer or really old stale lollies that Ive hidden from the kids months before!! This is a totally adorable idea! 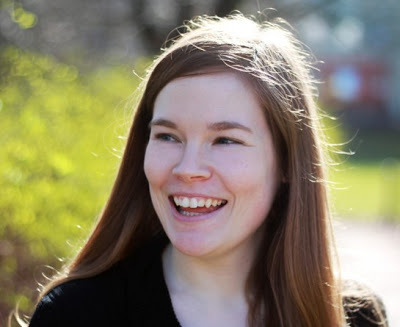 This is so awesome–you rock! Those pink eyeballs are pretty creepy, but I think I’d go for the chocolate ones. I think kids will love this.